The term otitis media means that there is inflammation of the middle ear. On the diagram to the left, this is the space between the external auditory canal and the inner ear (which contains the snail like cochlea). Otitis media can be associated with an infection or be sterile. In the first case, otitis media is usually caused by bacteria that migrate into the middle ear via the Eustachian tube. Occasionally otitis media may be caused by fungi or other pathogens, such as the herpes virus. In this situation, usually either there is a problem with immune function or (there is a hole (perforation) in the ear drum. Persons with diabetes are particularly suceptable to unusual pathogens such as pseudomonas. In the latter case, it is usually called serous otitis media, or "SOM". The serous variety of otitis media is usually not painful. There is usually a clear or straw colored fluid behind the ear drum. The serous variety is often attributed to allergy but may also occur from numerous other potential sources including radiation treatment (Young and Lu, 2001). The condition of otitis externa differs from otitis media, although both may be present simultaneously. In otitis externa, the external ear canal is inflamed. In otitis externa, there may be severe pain and a modest reduction in hearing, but generally there is no dizziness because otitis externa is separated from the inner ear by the ear drum and air filled middle ear. In children the most common cause of otitis externa is insertion of something into the ear canal (like a navy bean, for example). In adults, the most common cause is also insertion of something into the ear canal perforating the ear drum (usually a "q" tip, but sometimes hair-pins and as well as other thin and pointed objects). Adults may also compulsively clean their ears with cotton tipped applicators, and push wax deep into their external ear canals, resulting eventually in an external otitis. Chronic external otitis is diffuse low-grade infection that can persist for months to years. The disease is characterized by itching, a slight discharge, and a progressive narrowing of the external ear canal. There are about 30-35 million cases per year of otitis media. It accounts for 3% of all patient visits and is the #1 reason for an antibiotic prescription. Otitis media is very common in children. It is unusual in adults. Otitis externa in adults is often associated with swimming, and it is called "swimmers ear".Otitis externa is less common in children, although there is a substantial number of children who have irritation of their ears due to insertion of foreign bodies. Xrays, CT scans, or MRI scans are generally not necessary to diagnose otitis media or otitis externa. In persons who have rapidly worsening course however, a CT scan or MRI scan may be recommended to evaluate the mastoid sinus area. A lumbar puncture may be necessary in persons in whom meningitis is suspected. Typically, otitis media is treated with oral antibiotics. A bacteria named Strep Pneumoniae is associated with about 30-45% of cases. There are no strict criteria for use of antibiotics and it is presently thought that overly facile use of antibiotics is responsible for the present rather high incidence of resistant bacteria. The current recommendation is to use a double dose of amoxicillin from 40 mg/kg to 80 mg/kg. Other antibiotics are used if the initial treatment fails. The main problem with these antibiotics is the development of resistence to them and gastrointestinal side effects (such as diarhea). There is presently an effort underway to avoid treatment early on with antibiotics in children who are otherwise well, as it appears that they do little to alter the course of the disorder and tend to increase antibiotic resistence in the population at large. Serous otitis media is particularly common to be managed this way. If the patient is immunosuppressed or has diabetes melletus, however, all agree that treatment should be more aggressive. Sometimes local pain medications applied as drops to the external ear are helpful too. In situations where there is a perforation in the ear drum antibiotic drops may be prescribed. These may include sulfacetamide, neomycin/polymyxan, fluoroquinolones as well as many others. Uncommon treatments: Steroids -- oral, nasal and injected steroids are occasionally used but their use is presently controversial. Auto-ventilation. This involves the patient blowing ear into their middle ear through their nose. It is very unpleasant and the results are unpredictable. How is Otitis Exerna treated ? Otitis externa is usually treated differently than otitis media. Drops are used that deliver antibiotic directly to the infected skin of the external ear. Sometimes a "wick" is placed to deliver the antibiotics deeper into the ear canal. Local pain medications may also be used. As noted above, persons who are immunosuppressed or have diabetes are generally treated more aggressively with a combination of antibiotic drops and systemic antibiotics because of the prevalence of unusual organisms. Fungal infections are more common in this population also and treatment may also require use of an antifungal drug. While otitis media usually resolves uneventfully there are a number of quite serious potential complications. Otitis media may spread to the mastoid sinus (which lies behind the ear), causing a much more serious infection. OM may also occasionally cause a meningitis. Severe OM may permanently affect hearing and be associated with dizziness. 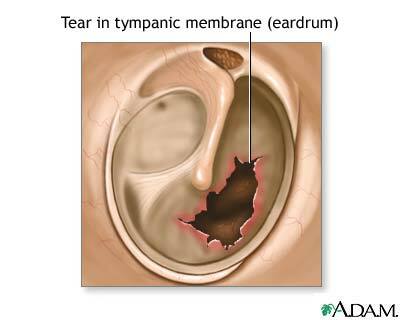 The ear drum may perforate (break). In children, otitis media can reduce hearing at a time that is critical for speech and language development. It is very possible for a child to have chronically reduced hearing, without much pain. A child may be unable to go to school for several days. Hearing is typically reduced and there is ear pain. Adults generally are impacted similarly. Acknowledgement: The graphics of the ear are courtesy of Northwestern University. Many children, especially those between the ages of 6 months and 6 years, get middle ear infections (otitis media). Children who attend day care are particularly susceptible, while older children experience ear infections less frequently. Ear infections are relatively easy to treat. Most of the time if the ear is inflamed and painful, your child's doctor will prescribe medication - generally an antibiotic. If your child has had multiple, resistant ear infections that aren't getting better, or has evidence of hearing loss or speech delay, your doctor may suggest ear tube surgery (tympanostomy tubes). Approximately 2 million tympanostomy tubes are placed in children in the United States yearly. Otitis media is an inflammation of the middle ear. The middle ear is a grape-sized, air-filled cavity located behind the eardrum. When the eardrum vibrates, tiny bones in the middle ear also vibrate and transmit the sound signals to the inner ear, where nerves relay the signals to the brain. 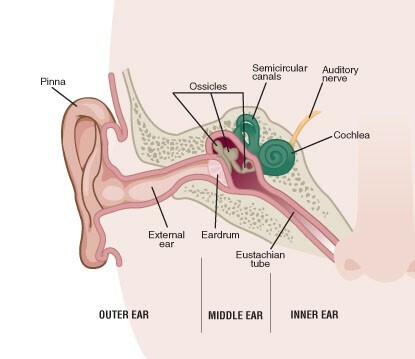 A small tubelike tunnel called the Eustachian tube serves to equalize the air pressure between the outside world and the middle ear. When your ears "pop" while yawning or swallowing, your Eustachian tubes are adjusting the air pressure in your middle ear. 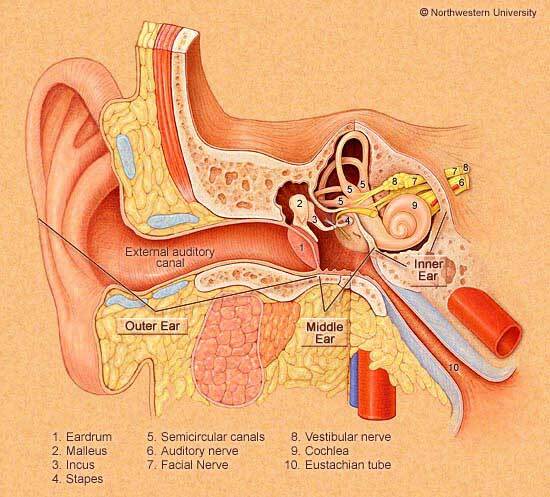 Bacteria and viruses can enter the middle ear through the Eustachian tube. The resulting infection, particularly if it is a bacterial infection, causes the middle ear to fill with fluid and sometimes pus. Pressure from this buildup pushes on the eardrum, causing pain. Because the eardrum cannot vibrate, your child may experience a temporary hearing loss. With treatment, a bacterial source of infection is stopped and your child's hearing is quickly restored. Without proper treatment, however, chronic ear infections can lead to long-term damage of the eardrum or the bones of the middle ear, and even permanent hearing impairment. Even temporary periods of hearing loss in young children can cause delays in speech development and learning. See your child's doctor if you suspect that your child has an ear infection. He or she will examine your child's eardrums, and if the ears are presumed to be infected from bacteria, treatment will begin immediately. If your child does not have an ear infection but shows signs of a hearing problem, your child's doctor will then consider other sources of the hearing loss. Although ear tube surgery is a relatively common procedure, surgery is not the first choice of treatment for otitis media. Antibiotics are the most effective primary treatment for bacterial ear infections. If your child's infection fails to respond to several courses of antibiotics; if ear infections are chronic or recur frequently; or if there is evidence of hearing loss or speech delay, your child's doctor may suggest surgery to drain the fluid and insert ventilation tubes. These tiny tubes, also called pressure equalization (PE) or tympanostomy tubes, are inserted surgically into the eardrum, where they remain to allow for continual drainage of fluid and normalization of pressure in the ear space. After a short time, your child's hearing will return to normal. Tympanostomy tubes greatly reduce the occurrence of further ear infections. Your child will be asleep for about 10 minutes. The surgeon can reach the eardrum through the external ear canal opening. There is no need to cut the skin. 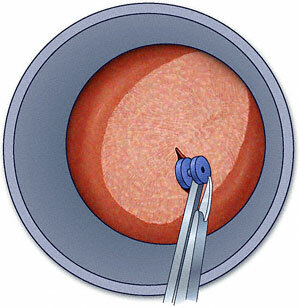 The surgeon makes a small hole in the eardrum and removes any fluid from the middle ear using suction. The surgeon inserts a small metal or plastic tube (1 to 2 mm) into the hole in the eardrum to let the remaining fluid and bacteria drain through the ear canal. Your child will wake up in the recovery area. In most cases, the total time in the hospital is about 2 hours. Children under 3 months of age and children with chronic conditions such as heart or lung problems, or cerebral palsy, will often stay overnight. Tympanostomy tubes help prevent recurring ear infections by allowing air to ventilate the middle ear. Other substances, including water, may sometimes enter the middle ear through the tubes, and this is generally not a problem. Doctors now suggest that earplugs are not usually necessary for routine bathing or swimming. However, your child should avoid diving or putting her head under water in a soapy bathtub without using some form of earplugs. In most cases, there is no need for further surgery to remove a tympanostomy tube. The tube generally stays in the ear anywhere from 6 months to 2 years, depending on the type of tube used. It usually falls out on its own, pushed out by the eardrum itself as it heals. Sometimes surgical removal of tubes is needed if they remain in the eardrum past 2 years; this is done to prevent scarring, permanent damage to the eardrum, and tissue buildup around the tube. Although effective in reducing chronic ear infections, ear tubes are not a one-time permanent cure for otitis media. Up to 25% of children who need ear tubes before the age of 2 may need tubes again. If you have a tympanometer in your office, you should begin to learn how to use it to verify the presence or absence of middle ear effusion. The tympanometer can provide particularly useful information if other diagnostic methods are not feasible, for example, if one cannot get a seal when performing pneumatic otoscopy, or when visualization of the TM is difficult. 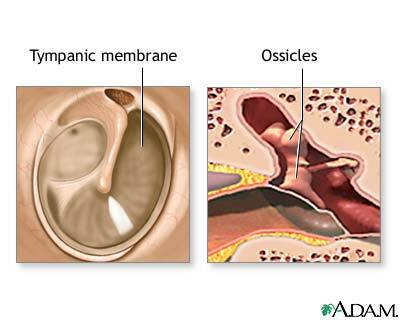 The tympanometer measures the compliance (sometimes called "admittance") of the tympanic membrane while different pressures are being applied to the external ear canal. A probe is inserted into the ear canal and emits a sound signal under different pressure conditions. The tympanometer measures the energy of the sound signal reflected by the TM at these different pressures. The compliance of the TM is measured in cubic centimeters, and the pressure in the ear canal is measured in decapascals (daPa). The probe has different sized "plugs" that provide a seal at the entrance to the external ear canal. The tip of the probe has a pressure transducer that changes the pressure in the external ear canal from negative, through atmospheric pressure, to positive pressure. While the pressure is changing, a sound transmitter sends a sound wave to the TM. The wave that is reflected from the TM is then picked up by a microphone in the probe. The tympanometer measures the energy of the reflected sound. If the middle ear space is filled with fluid, most of the sound is reflected back to the probe from the stiff TM, and a flat tympanogram tracing results (low compliance). If the middle ear space is filled with air, and the ossicles are intact, energy is absorbed by the TM, ossicles, and inner ear structures. The tracing will show a "normal" peak with normal compliance. If there is disruption of the ossicles, or if a portion of the TM is flaccid, a large amount of energy will be absorbed into the TM and the tracing will display an abnormal peak (high compliance). Children under six months of age may demonstrate falsely increased compliance, because the skin and cartilage in the ear canal are quite lax. In this situation, the child may have a middle ear filled with fluid, but still register a compliance within the normal range. The tympanometer automatically calculates the canal volume. If there is cerumen or other material occluding the ear canal, the volume will measure abnormally low. An accurate tracing cannot be obtained until this material is removed. Similarly, if there is a perforation of the TM, the tympanometer will measure an unusually large canal volume, because the space of the middle ear and mastoid air cells will be included in the volume calculation.